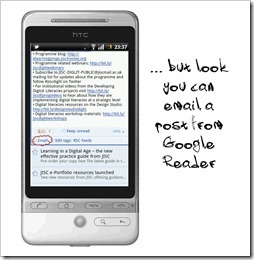 I’ve been a long time user of Google Reader. It’s been an up and down relationship even going through a trial separation, but I always come back. One of the things I’ve struggled with is a workflow that allows me to share and file interesting posts on the mobile version of Google Reader. I’ve previously experimented with custom Yahoo Pipes and services like ifttt.com but find these don’t give me the flexibility in editing tweet text or tags used to bookmark links. The slides below highlight the problem, if I want to personalise how a post is saved/shared you have to navigate out of Google Reader and then you are on reliant on share features of the source post or apps available on your phone. Here’s my solution. 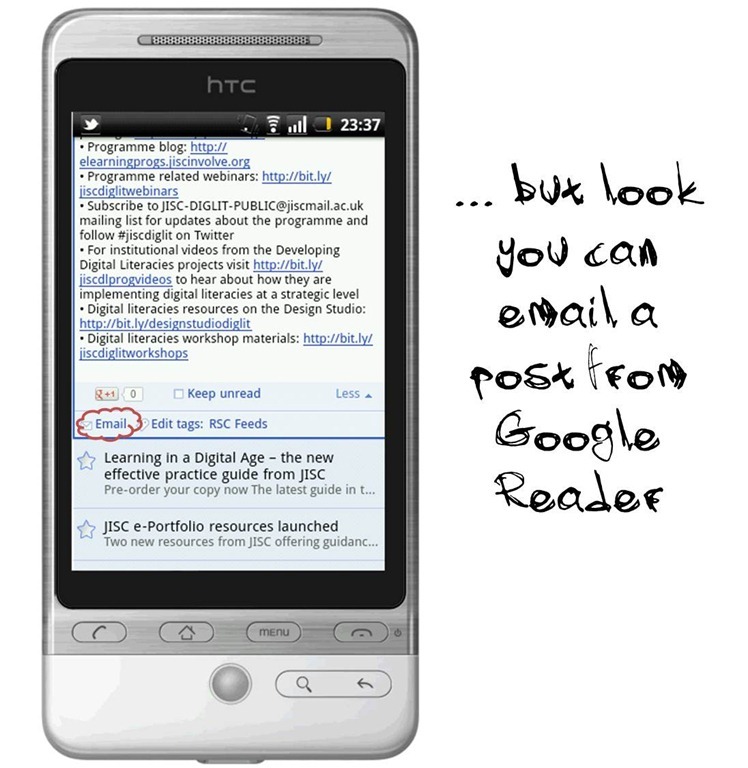 As Google Reader mobile has an email option it’s possible to push posts to different services without navigating away and still let you have control over what is saved/tweeted. 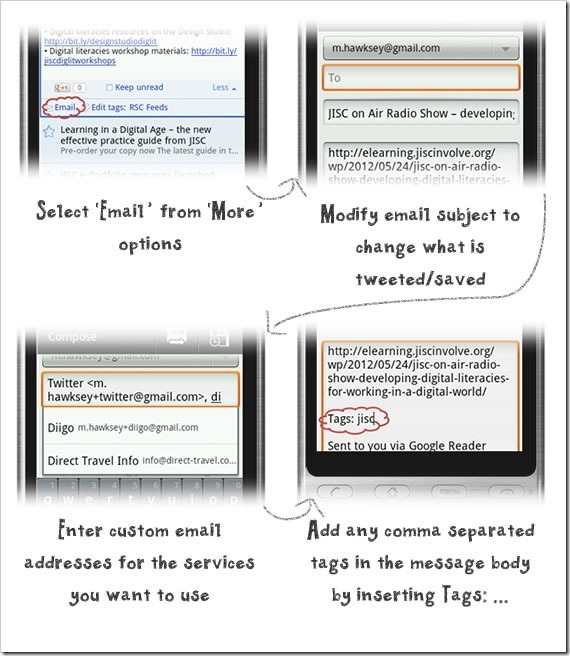 Initially I considered using existing services which let you create your own workflows by sending stuff to a dedicated email, example services which let you do this that I already use are Evernote and ifttt.com. Instead as there have been a number of Google Apps Script Gmail productivity solutions like Drew Csillag’s (sounds like cheese-log ;) Calorie Counting with Google Apps Script I thought I’d give that technique a go. This solution uses the old Gmail trick of adding +whateveryouwant to your email address to allow you to do custom filtering. For example, if I email m.hawksey+twitter[at]gmail.com the message still ends up in my inbox but it makes it easy for me to setup a filter rule. So using Google Apps Script I can search my Gmail inbox for messages from me with +twitter, +delicious or +diigo and then using oAuth or basic authentication pass links/messages through those service’s API’s, I hope you agree Google Apps Script at it’s finest. In summary, if I want to tweet something then I email the link to mygmailaccount[email protected], to save a bookmark either mygmailaccount[email protected] or mygmailaccount[email protected], or any combination of the three by sending the message to the email address. BTW if you are worried I’m wasting JISC CETIS time to make this fear not as this was an out of hours project. I also feel slightly annoyed with myself for spending so much time taking what was a functional solution (couple of hours work) and trying to make it more user-friendly for re-use particularly as the payback is minimal. Ho-hum. A nice tutorial. Love the last comment :-D You do wonder sometimes, don’t you?